Week Two in Madrid brought with it two new projects for me in the Department of Communications for World Youth Day 2011. Most recently, I have been researching a few of the many titles and places in which Mary, Mother of God, is venerated in Spain. 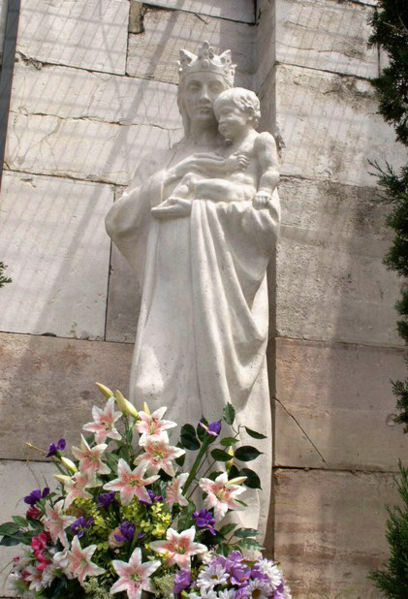 With the goal of eventual publication on the official World Youth Day website, http://www.madrid11.com, I have begun to write a series on these Spanish Marian devotions with the first article focusing on Madrid and this city’s patroness, the Virgin of Almudena (la Virgen de Almudena). Construction of Madrid’s cathedral, El Catedral Santa María la Real de La Almudena (literally, The Cathedral of the Royal St. Mary of the Almudena), was begun in the late nineteenth century, interrupted by the Spanish Civil War of 1936-1939, and completed in 1993. In the same year, the cathedral of Madrid was consecrated by Pope John Paul II. Santa María la Real de La Almudena also houses an iconic statue of its namesake. That statue has a fascinating mixture of history and legend behind it. An image of Mary was, according to legend, brought in about 40 AD/CE to Iberia, which has become contemporary Spain and Portugal, by the Apostle St. James the Greater, also a patron of Spain and of the famous pilgrimage, city, and cathedral Santiago de Compostela. Seven centuries later, the Moors invaded Iberia, and the statue was hidden for fear of its desecration in the wall of Madrid, then a small village in the shadow of Spain’s capital, Toledo. In 1085, after Christian troops under King Alfonso VI of Castile and León had re-taken Madrid, the Archbishop of Toledo ordered the statue of Mary found at the bidding of the villagers of Madrid. The task of finding la Virgen de Almudena, who is named after the Moorish granary (in Arabic, almudin) behind which the icon had been hidden, proved to be daunting. Then, again perhaps by way of a miracle or perhaps according to legend, the wall hiding the image of Mary crumbled, revealing not only Our Lady but two candles, still burning three centuries after they were placed in the wall along with the statue. The story of Our Lady of Almudena is not without controversy, even if it is to be considered mostly legendary. One must place it within the larger narrative of Spain’s history, which has included much conflict between people purportedly advancing the cause of several faith systems: in Spain, Christianity, Islam, and Judaism among them in Spain. Within Spain as beyond, religion has been used as a cover for violent conquest and warfare. Just as I cannot condone violence in the name of faith, which has been characterized especially by Benedict XVI (Deus Caritas Est, 1, 28, and Caritas in Veritate, 29) as opposed to reason itself, I believe that such violence ought not to be identified with any creed or with religious faith itself. Religious faith in its true sense respects the freedom of religion of each person and of all people. With almost as much conviction as I have in the right to freedom of religion, I also take to heart what a relative once told me: Religion is not religion without a sense of humour. On that note, I should mention my second “new” project this week in the Department of Communications. While still searching for interesting stories from youth from around the world and their preparation for World Youth Day in August, I have been asked to focus my search especially on French-speaking countries and their young pilgrims. Alors, oui, on travaille en Français ici à Madrid. Aux jeunes: On cherche vos histoires de comment vous préparez pour les Journées Mondiales de la Jeunesse ici en août. Cette semaine, j’ai été en communication avec plusieurs diocèses de France et du Canada, notamment le lieu de naissance du Curé d’Ars, Saint Jean Vianney, et le petit Vicariat du Territoire d’Outre-Mer de France près de la côte est du Canada, Saint Pierre et Miquelon. De ce dernier provient une petite blague religieuse qui a donné joie à notre pause café l’autre jour et qui satisfait aussi mon goût pour l’humour sur l’informatique (voir http://www.cheznoo.net/paroissecatholiqueSPM/humour/index_humour.html). Ma traduction en Anglais est suite à la version française originale. Yes, we work in French here in Madrid. To the youth: We are searching for your stories about how you are preparing for World Youth Day here in August. This week, I was in communication with several dioceses of France and of Canada, notably the birthplace of the Curé d’Ars, St. John Vianney, and the small Vicariate of the French Overseas Territory off the East Coast of Canada, Saint Pierre et Miquelon. From the latter, I found a little religious joke that added joy to our coffee break the other day and that also satisfies my taste for computer-related humour (see http://www.cheznoo.net/paroissecatholiqueSPM/ humour/index_humour.html). My English translation follows the original French version. 1. Au commencement Dieu créa le bit et l’octet. Puis il créa le mot. 2. Et il y avait deux octets dans un mot; et rien d’autre n’existait. Et Dieu sépara le zéro et le un, et il vit que cela était bon. 3. Et Dieu dit: Que les données soient! Et ainsi cela fut. Et Dieu dit: Plaçons les données dans leurs lieux respectifs. Et il créa les disquettes, les disques durs et les disques compacts. 4. Et Dieu dit : Que soient les ordinateurs, pour qu’il y ait un lieu pour y mettre les disquettes, les disques durs et les disques compacts. Et Dieu créa les ordinateurs. 5. Mais le logiciel n’existait pas encore. Mais Dieu créa les programmes ; grands et petits… Et Dieu leur dit : allez et multipliez-vous, et remplissez toute la mémoire. 6. Et Dieu dit : je créerai le Programmeur ; et le Programmeur créera de nouveaux programmes et gouvernera les ordinateurs et les programmes et les données. 7. Et Dieu créa le Programmeur, et il le mit dans le centre de données ; Et Dieu montra au Programmeur le répertoire et il lui dit : tu peux utiliser tous les volumes et sous-répertoires, mais N’UTILISE PAS WINDOWS. 8. Et Dieu dit: ce n’est pas bon que le Programmeur soit seul. Il prit un os du corps du Programmeur et il en créa une créature qui regarderait le Programmeur; qui admirerait le Programmeur ; qui aimerait les choses faites par le Programmeur. Et Dieu nomma la créature “Utilisateur”. 9. Et il laissa le Programmeur et l’Utilisateur nus dans le DOS, et il vit que cela était bon. 10. Mais Bill Gates était la plus maligne de toutes les créatures de Dieu. Et Bill Gates dit à l’Utilisateur: Dieu t’a vraiment dit de ne pas utiliser TOUS les programmes? 11. Et l’Utilisateur répondit: Dieu nous a dit que nous pouvions utiliser n’importe quel programme et n’importe quel bloc de données, mais il nous a dit de ne pas utiliser Windows parce que nous pourrions mourir. 12. Et Bill dit à l’Utilisateur : Comment peux-tu parler de quelque chose que tu n’as même pas essayé ? Des que tu utiliseras Windows tu seras égal à Dieu. Tu seras capable de créer tout ce que tu voudras rien qu’en touchant la souris. 13. Et l’Utilisateur vit que les fruits de Windows étaient meilleurs et plus faciles à utiliser. Et l’Utilisateur vit que toute connaissance était inutile, puisque Windows pouvait la remplacer. 14. Et l’Utilisateur installa Windows dans son ordinateur; et il dit au Programmeur que cela était bon. seras condamné à toujours vendre Windows. 17. Et Dieu dit à l’Utilisateur: Pour ce que tu as fait, le Windows te trompera et consommera toutes tes ressources; et tu ne pourras utiliser que de mauvais programmes que tu utiliseras dans la douleur et l’angoisse; et tu seras toujours sous la tutelle du Programmeur. 18. Et Dieu dit au Programmeur: Pour avoir écouté l’utilisateur tu ne seras jamais heureux. Tous tes programmes seront farcis d’erreurs et tu seras condamné à les corriger et les recorriger jusqu’à la fin des temps. 19. Et Dieu les expulsa tous du Centre de Données et il en bloqua la porte avec un mot de passe de 999 octets. 1. In the beginning, God created the bit and the octet, and then he created the word. 2. And there were two octets to a word; and nothing else existed. And God separated the zero from the one, and he saw that it was good. 3. And God said, “Let there be data!” And so there was. And God said: “Let us put the data in their proper places. And he created diskettes, hard drives, and compact discs. 4. And God said: “Let there be computers, so that there might be a place to put the diskettes, the hard drives, and the compact discs. And God created computers. 5. But the network did not exist yet. But God created programs, great and small… And God said to them: Go forth and multiply, and fill all the memory. 6. And God said: “I will create the Programmer; and the programmer will create new programs that will give order to computers, programs, and data. 9. And he left the Programmer and the User naked in DOS [Disk Operating System, a kind of electronic Eden I suppose], and he saw that it was good. 13. And the User saw that the fruits of Windows were better and easier to use. And the User saw that all knowledge was useless, because Windows was able to replace it. 14. And the User installed Windows on his computer; and he said to the Programmer that it was good. 19. And God expelled them all from the Data Centre, and he blocked the gateway with a password 999 octets long. From Madrid (De Madrid malencontreusement utilisant Windows; Desde Madrid, desafortunadamente usando Windows), using Windows, unfortunately: Warren Schmidt, CSB. The Synoptics [the Gospels of Matthew, Mark, and Luke] contain just one Passover feast– that of the Cross and Resurrection; indeed, in Saint Luke’s Gospel, Jesus’ path is presented as a single pilgrim ascent from Galilee to Jerusalem (Jesus of Nazareth, Holy Week, 2). From these “little ones,” praise will always come to him; from those able to see with pure and undivided hearts, from those who are open to [God’s] goodness (Jesus of Nazareth, Holy Week, 23). With “pure and undivided hearts,” let us then welcome Christ, the God-man who, as the theme of World Youth Day 2005 in Cologne, Germany, in which I participated as a pilgrim, reminds us, is always with us: Gott ist mit uns (Matt 1:23). These related themes of welcoming God and of pilgrimage bring me to a last thought to integrate into this article: Much has been spoken in these last few days I have been in Madrid about the previous and only other time that Spain hosted World Youth Day, in Santiago de Compostela in August, 1989. Santiago de Compostela and its cathedral in honour of the Apostle St. James is the terminus of the famous Camino de Santiago de Compostela, whose main section originates in the French Pyrenées and is over seven hundred kilometres long. El Camino is a pilgrimage par excellence! The early Christians knew themselves as ‘followers of the Way’; they were instructed in the Way of the Lord. All Christian life must find its centre in Christ our Lord, the Way, the Truth, and the Life, and the authentic teaching of the Gospel is the first and essential guide for anyone who wants to follow this way of life (Basilian Way of Life, no. 1). Desde Madrid (from Madrid), Warren Schmidt, CSB. ¡Ya vamos! Here we go! Today was the first full day of work for me, in the Department of Communications, and for a friend and university colleague with whom I travelled here and with whom I am living in Madrid, who is in the Department of Culture, in preparation for World Youth Day 2011 that will take place August 16-21. So far, I have been impressed by Madrid, from the helpfulness of our host family to the cleanliness, order, and expanse of Madrid’s metro system, to the climate– that said, we have yet to feel the brunt of the renowned Madrid summer heat– to the welcome we have received from fellow World Youth Day staff and volunteers. My first day consisted of meetings and of e-mailing Canadian and American youth ministers from several parishes and dioceses. In establishing new contacts and following up on old ones with youth ministers and the youth that they serve, I am searching for stories from English-speaking youth who will be participating in this year’s “JMJ” (the Spanish acronym for World Youth Day, la Jornada Mundial de la Juventud) for web-based publication. The Spanish work day begins and ends much later than the usual work day in Canada. Meal times are also longer and much later; with a fellow Canadian in Communications I concurred that for my Canadian stomach to get used to this it will take some time. Warren Schmidt, desde Madrid (from Madrid) JMJ/WYD 2011.